We had a bad psychology going on in the studio - all of the books were in a little room in the back. It sent the message that they weren't worth looking at, or that they weren't accessible. 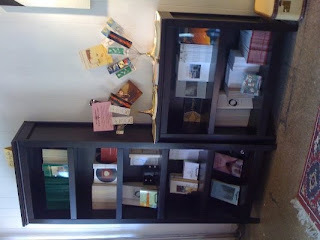 So this weekend during gallery hours we put together two sets of bookshelves in the front of the studio where people can easily view and browse the titles. A good move all around - it opened up the studio space (we originally had a table there that took up a lot of space just to hold flyers), and it makes it obvious what we do and what's for sale. In May, when I'm done with residencies, I'll start keeping regular weekly hours there. I'm moving my computer into the room that used to house the books and will be handling all press-related work at the studio. Bunnies from Mom arrived in the mail on Friday. 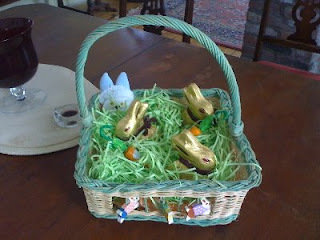 They landed in the grass of our collective Easter basket. The Canadian side of Niagara Falls. 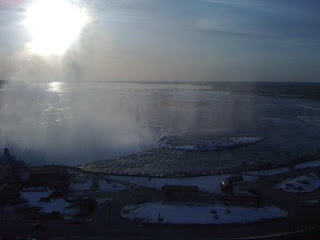 Over the weekend we were in Buffalo, NY,(for the Small Press Book Fair), Niagara Falls, Canada, (to sleep) and London, Ontario (to help Dan finish up 700 covers of a literary journal). We got home at 2 a.m. this morning. I'm feeling a little blurry. 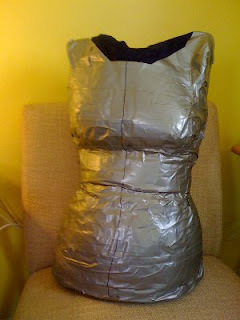 Who says you can't make a replica of your torso out of duct tape? This one is mine - the almost perfect (slightly lopsided?) dress form for my wedding gown. I have to ship it to my sister in Tokyo. She's making the pattern for my dress, and found the instructions for the dress form on Etsy Labs. It's always nice when someone puts their arms around a poem and leads them through the door to a warm living room. "Trotsky's Axe" and "Goodbye Goodness" will appear in the May issue of The Chimera. I'll add the link when the new issue is ready. Where do you find your ideas/inspiration? What appeals to you most about your particular genre? Do you feel that you have “made” it as a writer, and when did that happen? I've listened to panel discussions at writing conferences and gatherings. Sometimes they are really inspiring - usually when they have a topic - like "Privacy" or "Writing the Political." Talking about writing is just that - talking about writing. Ultimately, writers write. I don't know if telling anyone my writing routine is going to inspire them to write. The organizer of the event has said that these are just questions to get the discussion going - so I hope that the discussion goes off on some complex tangents - fast. I have a lot of free time in between some of the classes I've been teaching, and I'm far enough away from home that I can't just go home to handle work and errands, which on some level is good. It gives me time to write, prepare lessons, and think. Yesterday I spent a little time lolling about in a bookstore, reading various books on creative writing where I found an exercise about titles. I think I'll get this book, which is called "Naming the World," and has a terrific essay by Tom Robbins on using envy to fuel your writing. I almost bought the book yesterday, but then realized I was in a big box store, and can order it from my friendly independent instead. So for now, I'll just hang out in the big box, review and read the books, sip tea, write and then order everything I like from Anthology. Write a word you like just for the sound. Write a word that conjures some negative memory. Write a song or album title. Write an adjective and a noun combination. Write a word (or phrase) that conjures some happy childhood memory. Once you have your list, you now have six titles. Write one page stories that go with those titles. A simple exercise! And pretty damned inspiring. I had time to write my first story, which gets it's title from the first prompt. A train takes off from the station, the metal fists between cars punch their curved sockets, trees blur in flashbacks and forwards. Passengers settle into their separate news sources - papers, wifi laptop versions of the New York Times, iPhone triangulation of final destination directions. A man in a camel colored coat burrows into a novel that his wife recommended, but can't get past the first few sentences. Two women speak in hushed tones about the role of Paul in the bible, one clears her throat over and over while trying to convince her friend about the wickedness of the world and her own transformation in the discovery of God. Her shiny purple eyeshadow migrates to her upper cheekbone each time she touches her face. The other woman's mind drifts from the conversation, spotlights her concerns with her waist. Her husband used to curve his arm around her to fall asleep, and now he prefers to stay awake with vodka and crosswords. The conductor walks the aisle, tears perforated tickets down the center, punches empty stars into the numbers for each stop. Lights wink off and the train floats on its tracks, guided by gravity's passive aggressive desires. Yesterday, I was asked to contribute some short poems (no more than eight lines) for use in the Poetry in Motion project here in Wilkes-Barre with the Luzerne County Transportation Authority. This is exciting to me - the idea of a poem occupying a space that would normally be filled with an advertisement. So this week I'll be thinking in eight line or less phrasings. The 2008 Buffalo Small Press Book Fair takes place on Saturday, March 22, 2008 from noon to 6pm. The event will be held at the Karpeles Manuscript Library Museum, Porter Hall, located at 453 Porter Avenue in Buffalo, NY. The book fair is a one day event that brings booksellers, authors, bookmakers, zinesters, small presses, artists, poets, and regional cultural workers together in a venue where they can share ideas and peddle their wares. Tables will be available at the event where people can showcase and sell their work. Poetry readings, performances, discussions, and related lectures are also scheduled to go on throughout the day. The event is FREE to attend and open to the public! Paper Kite Press will be one of the 80+ vendors there. You've got a great idea for a play. You research how to write a play, maybe you take a couple of classes, and you read a bunch of plays. Man, that idea you have is so great you just like to flash it through your mind over and over. Parts of it are vague, sure, but it's the idea of the century! You tell people you are working on a play. They are impressed - you're a writer! They ask you what it's about. You reveal parts of your idea. You've never written a word of it. It's all still up in your head. Why? Because that's where it's safe. On the page, it might take another turn. The idea might change. The characters might speak for themselves. In your head, every detail is just the way you want it. Nothing changes. Everything stays the same. There is no risk. Your idea is a character standing by a door. She's got her hand on the doorknob, but she's not allowed to move. She just stands. There is no action. If you don't write, you're not a writer. I don't care what kind of writerly outfit you wear, how quirky you are, how much coffee you consume, how misunderstood you feel. Write. Let yourself write badly. Don't tell people about your idea, write your idea. Let it take on the life it was meant to have, not the one that is safe. The best writers are those who write all their ideas - the good, bad and ugly. Eventually one of them sticks. FREE and Open to the Public! Don't Miss this Great Poetry Event! Eight high school students from schools all over the region will recite great poems in the NEIU 19 Regional Competition of Poetry Out Loud: National Recitation Contest. Created by the National Endowment for the Arts and The Poetry Foundation, Poetry Out Loud encourages high school students to memorize and perform great poems. Poetry Out Loud invites the dynamic aspects of slam poetry, spoken word, and theatre into the English class. This exciting new program helps students master public speaking skills, build self-confidence, and learn about their literary heritage. The competition begins at the classroom level, with winners advancing to school-wide, then regional, state, and ultimately to the National Finals in April where the winner will receive a $20,000 scholarship prize. The regional competition, sponsored by Pennsylvania Council on the Arts, NEIU 19, Lackawanna County Office of Arts and Culture, Wilkes University, Keystone College, and the Mellow Theatre, will be held on Monday, March 3rd at 7 p.m. at the Mellow Theatre in Scranton. Eight schools will bring one student each to compete in the semifinals. One will be chosen to advance to the state level competition to be held March 12th at the Governor's Residence in Harrisburg. The winner of the final state competition will receive an all expense paid trip to Washington D.C. (with a chaperone) to compete in the National Poetry Out Loud Competition to be held on April 29th, 2008.